Just wanted you to letchu know that this insanely delicious post is sponsored by my friends over at PB 8™! 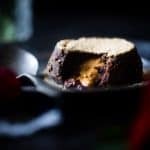 This gluten free peanut butter chocolate lava cake recipe is so rich and delicious you’ll never know it’s protein packed, low carb and sugar free! 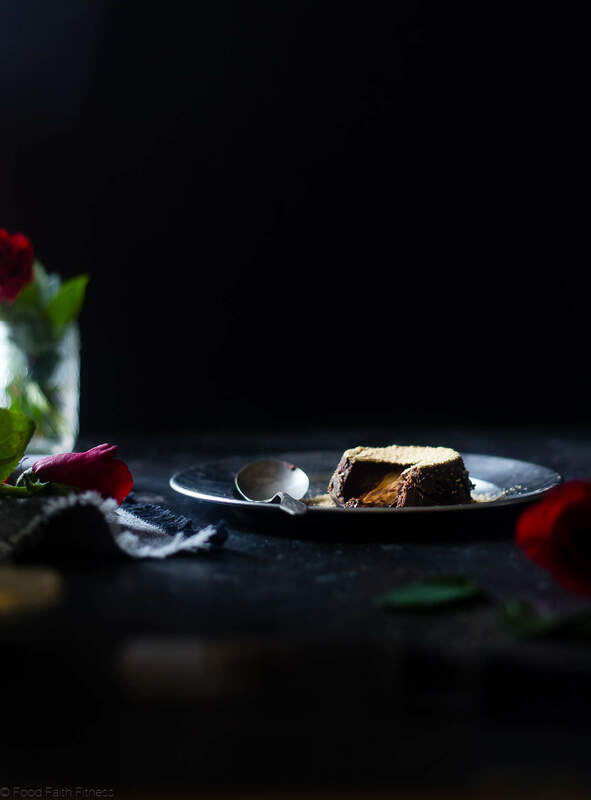 The perfect healthy dessert for Valentine’s Day! Oozy, ooey-gooey peanut butter MELTING out of a chocolate-y tower of super-dense, ultra-MAGICAL cake. 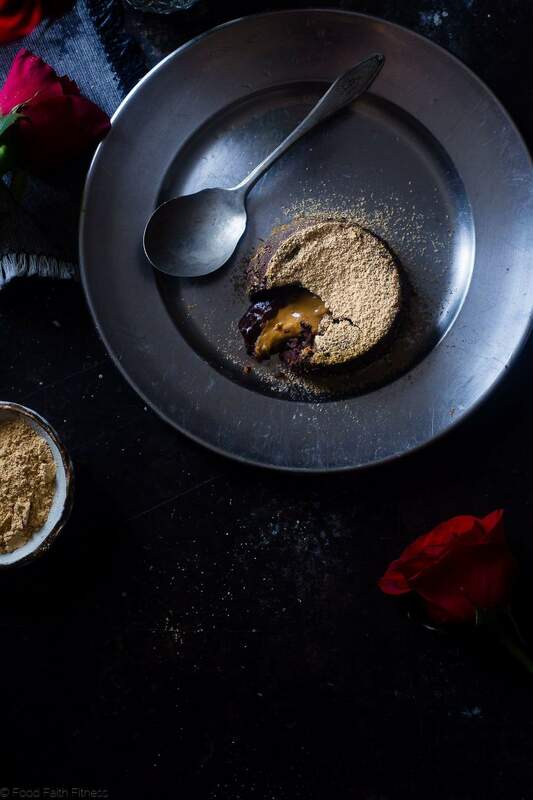 If you’re a mega chocolate loving person, who gets really excited about mega-chocolate-ness in combo WITHHHHHH peanut butter, then your taste buds are going to be like “OH HECK YASSSS” when each bite of ultra-rich cake, flowing with melty peanut butter tingles on your tongue. Chocolatey-peanut butter cake that JUST SO HAPPENS to be sugar free, lower carb, SUPER high in fiber, and has a secret punch of probiotic protein nutrition! And, since you also went crazy over the chocolate peanut butter overnight oats, there is a 0% chance that I need to tell you that the mixing of the flavor profiles that are peanut butter and chocolate is the TRUE CHAMPION of the food combination world. Especially when it’s in cake form that only requires you to wait a total of 15 minutes from start to finish. IE: cake in your face, liiiiike, NOW. Cake in your face that perfectly serves 2! <— Hello perfect Valentine’s Day dessert, it’s nice to EAT you. Let’s just press PAUSE on Valentine’s Day for a sec’ though. It’s basically a day where you get to stuff sugar into your belly in the name of TRUE LOVE. How-EV-er, we just got over Christmas which was ALSO a time of sugar and cookie stuffing. <— I know I am not the only one JUUUUUST getting over a spiced paleo cookies coma. All this dessert shenanigans tastes RLY RLY GOOD in your mouth, but it miiiight not feel so good in your bodies ya know? That’s why this chocolate cake HEAVEN is made with NO butter, SUPER MINIMAL oil, a natural, calorie-free sweetener ANNNNNNNNNNND my probiotic protein obsession: Greek yogurt. But, with only 2 Tbsp. of yogurt per cake, I HIGHLY suggest you add a little more probiotic power to your life, to keep your tummy feelin’ happy and healthy. This is the point in the cake story where you ask “HOW DO I DO DAT?” I obvi have an answer for you: PB 8™ Probiotics! Not to mention they’re dairy, gluten and soy free. <— You can swallow ‘em down without a worry! In combination with face-planting into oozy-molten-lave-cake-perfection, you’re packing a PROBITOIC POWERHOUSE that’s going to make your gut feel easy-breezy, even with the just-ate-Christmas-treats-now-it’s-Valentine’s-Day moment that is about to happen to your very real life. In other news: have you tried Monkfruit yet? I’ve been playing with different, calorie-free sweeteners, and this one has been a total WINNER for me. No weird after taste, no calories, but ALL THE SWEETNESS. 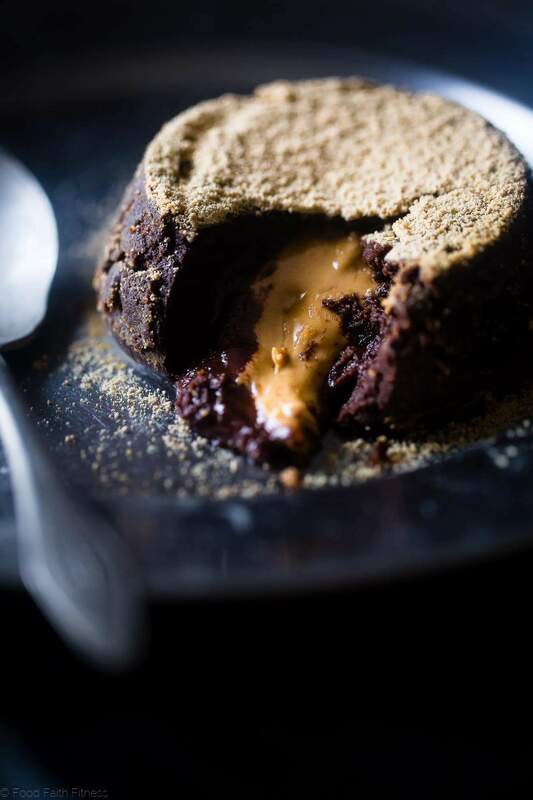 ALMOST as much as you’re going to enjoy diggin’ into an EXPLOSION of chocolatey-peanut butter lava cake. 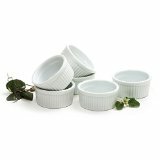 Preheat your oven to 400 degrees and generously rub 2, 5 ounce ramekins with coconut oil. Sprinkle the insides with a light coat of powdered peanut butter, until fully coated. In a medium bowl, using an electric hand mixer, beat together the egg, egg yolk, monkfruit, Greek yogurt, vanilla extract and salt until well combined. 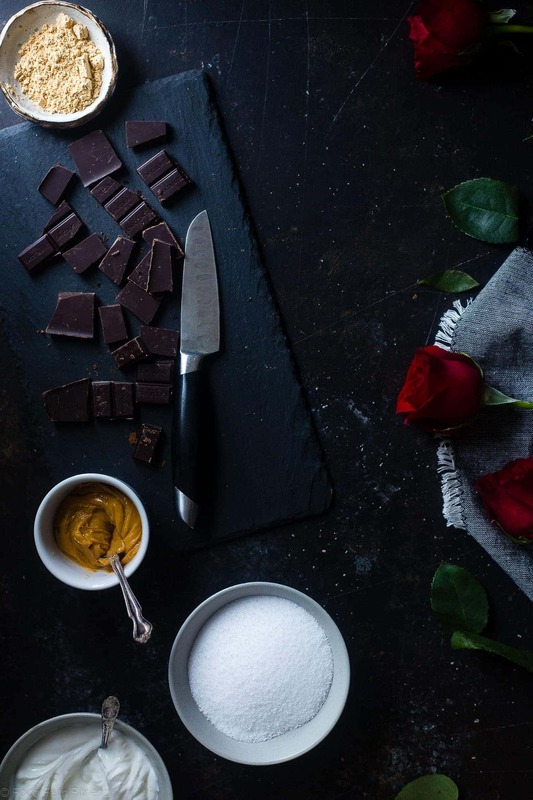 Place the chocolate and coconut oil into a large, microwave-safe bowl and microwave using 30 second intervals and 50% power, stirring between each interval, until smooth and melted. Pour the egg mixture into the melted chocolate, whisking constantly, until smooth and mixed. Finally, whisk in the 2 Tbsp of powdered peanut butter until smooth. Fill each of the ramekins half full. 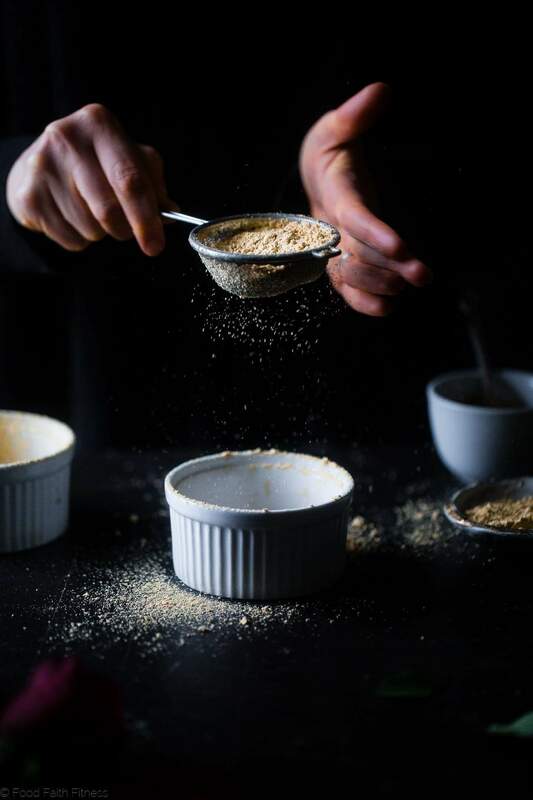 Then, place 1/2 Tbsp of peanut butter into the center of each ramekin, lightly pressing into the batter. Divide the remaining batter between the ramekins, filling 3/4 of the way full. Bake until the edges feel set and the inside is still a little soft, about 10 minutes. Once out of the oven, let stand for 1 minute. Then, gently run a knife along the outside of the ramekin and place a place upside down on top.Gently turn the plate/ramekin over and the cake will slide right out. Sprinkle with additional powdered peanut butter and DEVOUR immediately! THIS POST IS SPONSORED BY MY FRIENDS AT PB 8™. THANK YOU FOR ALLOWING ME TO CONTINUE CREATING GREAT CONTENT FOR YOU BY SUPPORTING PARTNERSHIPS WITH SUPER-FAB BRANDS THAT FOOD FAITH FITNESS LOVES TO WORK WITH! AS ALWAYS, OPINIONS REMAIN 100% MY OWN! 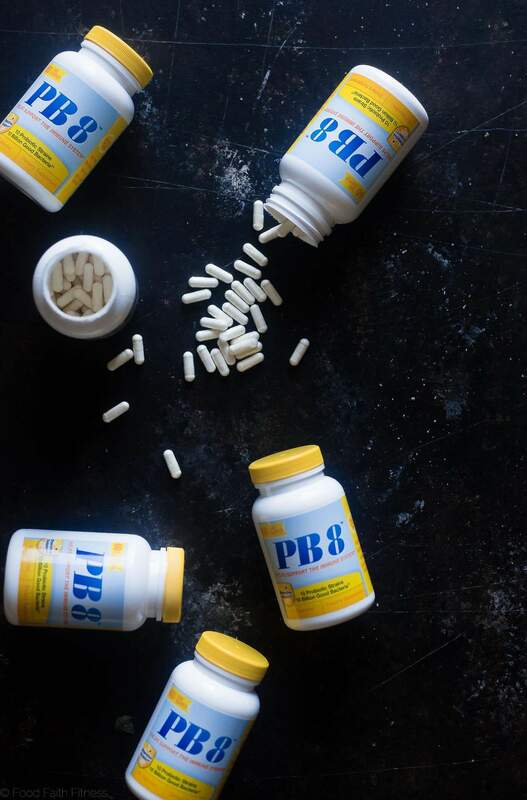 To get your hands on PB 8 Probiotic, check out Amazon, Vitacost or Puritan’s Pride online! Or click HERE to get a $1 off PB 8™ Coupon! WANT TO WIN SOME OF YOUR OWN PB 8™? USE THE WIDGET BELOW TO ENTER! No purchase necessary. This giveaway is available to residents of the USA, aged 18 and over only. It will run from 02/08/2017 until 02/15/2017. 3 winners will be announced, displayed on the widget and contacted via email within 48 hours. The winners have 48 hours to claim their prize, or a new winner will be selected in their place. My husband would LOVE these! I feel like the only person on earth who doesn’t’ like peanut butter. But I live vicariously of you, these DO look good! Then your husband would be glad to have both cakes, right?! lol Thanks! These totally need to be in your life Bethany! Nothing like the real experience! GO FOR IT! Wow! This dessert looks and sounds amazing! Thanks April! Would love to know if you try it! Adding this to our Valentine’s Day menu!! Gorgeous!! Girl, this look insanely delicious! Love that it’s lower carb, too. What a nice Valentine’s Day treat! Definitely! Hope you’ll try! Thanks Bianca! This looks so good! I want to run into the kitchen and make it right now, but I don’t have monkfruit sweetener, probably the only sweetener I don’t have. Will have to get some. Get some stat! lol You’ll be so glad you did Sarah! If I show this to our oldest daughter, I’m betting we’ll be making this soon! YUM! And so you should! Let me know what you think! Thanks Brenda! I actually can’t stop drooling. Classic pb/chocolate combo + lava cake deliciousness? Yes! It’s a must make for sure! Thanks Jennifer! Lava cakes are always amazing but this is extra special!!! This is such a fun treat for Valentine’s Day! That filling looks amazing! Sugar free! Wowza! These look rich and gooey and just FAB! These look fab! I love that they are healthy and tasty! I need more probiotics in my diet for sure! Don’t we all!? Thanks Cynthia! LOVE the peanut butter center!! I’ve seriously always wondered how to make a lava cake, yeahhh thanks for teaching me…now to actually do it! Haha it’s SO easy! you got this! I love a good chocolate lava cake. Adding PB is brilliant! I’m totally with you on not wanting to overdo it on the sugar! I always have powdered peanut butter on hand and this recipe is totally calling my name. Chocolate and PB is the best combination ever! You had me at chocolate and peanut butter!! lava cakes are the best. so great for Valentine’s Day! Thanks Nicole! We love them too! I’ve got to look for those capsules because probiotics do a body good!!! And that cake??!!! Wow Taylor! So stunning! These look fabulous! 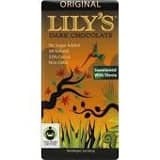 And a great way to indulge without the guilt. Oh I SOOOOO know what you mean! But, it really does help!! I will need to try this now that my son isn’t allergic! Wow, no one would know that this has extra probiotics in it… I love chocolate and PB, and this looks like this would not disappoint. Right?! Yay for sneaking in the healthy gut! Thanks Emily! 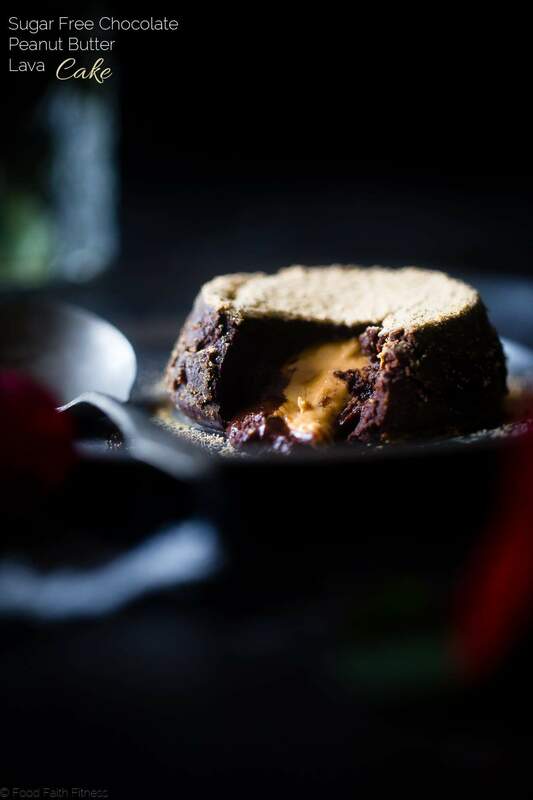 Loving this twist on the traditional lava cake! These look amazing!! 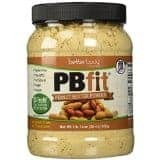 And I have to check out PB8 because I need a new probiotic! Fabulous!!! Thanks for linking up with What’s Cooking Wednesday! 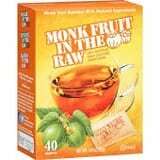 What can be substituted and the quantity for monkfruit? You can try regular granulated sugar. But, I really can’t tell you as recipes are only tested as written – I am sorry. It SHOULD work as a 1:1! I was hoping for another sugar free option (can’t find monkfruit), but thank you. You can try any granular sugar free replacement and it SHOULD work, I just don’t want to make a promise that I can’t keep! I am glad you liked it Natalie!! Can you use coconut palm sugar for this recipe?